Limerick ( or Irish: ) is a city in Ireland. It is located in the Mid-West Region and is also part of the province of Munster. Limerick City and County Council is the local authority for the city. The city lies on the River Shannon, with the historic core of the city located on Kings Island, which is bounded by the Shannon and the Abbey River. Limerick is also located at the head of the Shannon Estuary where the river widens before it flows into the Atlantic Ocean. Limerick is the third most populous city in the state, and the fourth most populous city on the island of Ireland. There are 102,161 people living in the Limerick City Metropolitan District. On 1 June 2014 following the merger of Limerick City and County Council a new Metropolitan District of Limerick was formed within the united council which extended the city area. The Metropolitan District includes the city urban area and extends outwards towards Patrickswell in the west and Castleconnell in the east. The City Metropolitan Area however excludes city suburbs located within County Clare. When included this increases the overall city & metropolitan area by a further 5,000 with a combined total population of 107,161. According to Eurostat, the statistical branch of the European Commission, the population of the Limerick Larger Urban Zone is 162,413. Limerick is one of the constituent cities of the Cork-Limerick-Galway corridor which has a population of 1 million people. It is located at a strategic position on the River Shannon with four main crossing points near the city centre. To the south of the city is the Golden Vale, an area of rich pastureland. Historically, much of the citys industry was based on this rich agricultural hinterland and it is particularly noted for Limerick Ham. Luimneach originally referred to the general area along the banks of the Shannon Estuary known as Loch Luimnigh. The earliest settlement in the city, Inis Sibhtonn, was the original name for Kings Island during the pre-Viking and Viking eras. This island was also called Inis an Ghaill Duibh, The Dark(haired) Foreigners Island. The name is recorded in Viking sources as Hlymrekr. The city dates from 812 which is the earliest provable settlement ; however, history suggests the presence of earlier settlements in the area surrounding Kings Island, the island at the historical city centre. Antiquitys map-maker, Ptolemy, produced in 150 the earliest map of Ireland, showing a place called "Regia" at the same site as Kings Island. History also records an important battle involving Cormac mac Airt in 221 and a visit by St. Patrick in 434 to baptise an Eóganachta king, Carthann the Fair. Saint Munchin, the first bishop of Limerick died in 652, indicating the city was a place of some note. In 812 the Vikings sailed up the Shannon and pillaged the city, burned the monastery of Mungret but were forced to flee when the Irish attacked and killed many of their number. The Normans redesigned the city in the 12th century and added much of the most notable architecture, such as King Johns Castle and St Marys Cathedral. 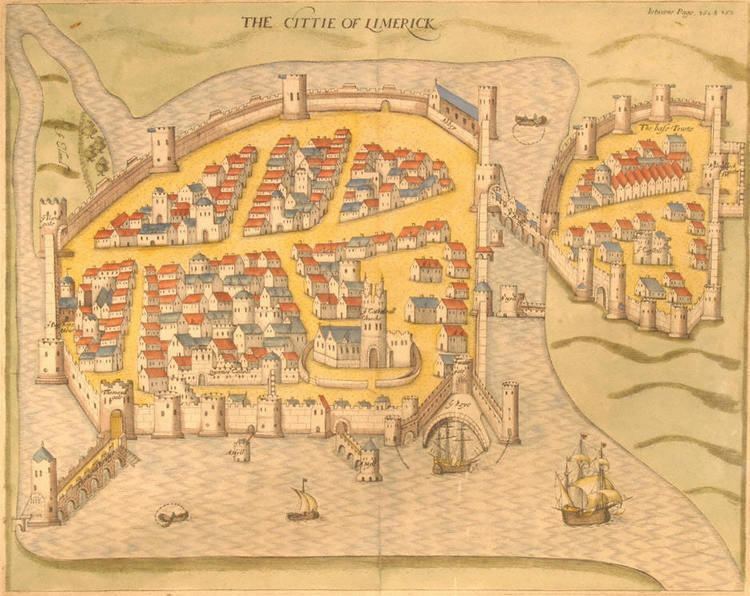 In early medieval times Limerick was at the centre of the Kingdom of Thomond which corresponds to the present day Mid West Region however, the Kingdom also included North Kerry and parts of South Offaly. One of the kingdoms most notable kings was Brian Boru, ancestor of the OBrien Clan of Dalcassians. The word Thomond is synonymous with the region and is retained in place names such as Thomondgate, Thomond Bridge & Thomond Park. In 2014, Limerick became Irelands inaugural National City of Culture, with a wide variety of artistic and cultural events occurring at various locations around the city. 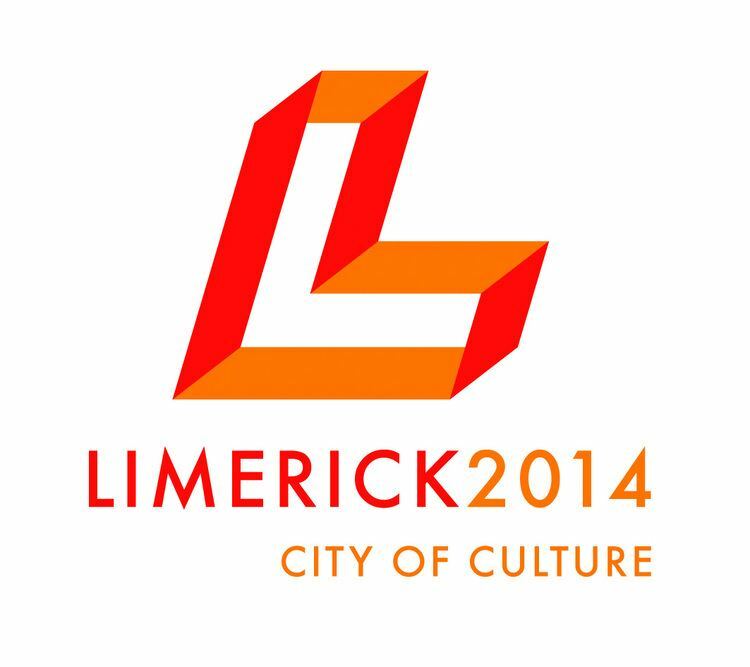 Limerick City of Culture began at 12.01am on 1 January 2014 and ran for the full year to raise the profile and promote Limericks cultural heritage. The year was book-ended with large New Years Eve celebrations in the city center. Throughout the year there were a number of events including the Royal De Luxe street theater companys Saga of the Giants from 5 to 7 September. The Limerick City Gallery of Art on Pery Square is the citys chief venue for contemporary art exhibitions. It is home to a permanent collection of Irish art, which shows works from the early 18th to 20th century. The gallery houses the National Collection of Contemporary Drawing founded by the artist Samuel Walsh in 1987. Limericks major contemporary art event is EVA International, Irelands Biennial of Contemporary Art. EVA International (formerly EV+A – Exhibition of Visual+ Art) is curated by a new guest curator every two years and includes contemporary artworks by both international and Irish artists. The centre of the exhibition is the Limerick City Gallery of Art, but EVA generally uses numerous other venues throughout the city including public spaces. The Lime Tree Theatre officially opened at the Mary Immaculate College campus on 30 October 2012. The modern venue is able to host theatre, music, comedy, traditional arts, schools performances and conferences. The Belltable Arts Centre on OConnell Street (in liquidation as of February 2013) hosts for local playwriting and drama. Mike Finns numerous plays have been successful, including Pigtown, set around a century of the citys history, and Shock and Awe, an energetic retelling of Homers Iliad. The University Concert Hall located in UL is a 1,000 seat venue and provides a large venue for national and international acts to visit the city. Limerick is also the home of street theatre companies, including "The Umbrella Project". Other active Limerick arts groups include Contact Studios, which provides individual studio spaces for visual artists; the Daghdha Dance Company, a contemporary dance company that has adopted a renovated church in Johns Square, adjacent to St Johns Cathedral, as a performance space); the Fresh Film Festival, which is held each spring, and includes films made by young people (7–18 years) from all over Ireland; Impact Theatre Company; and Limerick Printmakers Studio and Gallery, which provides printmaking facilities, a venue for exhibitions and events and an education programme. The Limerick Youth Theatre provides young people with an opening into acting and production. It received attention in the national media with its 2005 production of Romeo and Juliet, which made comparisons between the ongoing feud in the city with that of the Montagus and the Capulets in the play. The Irish Chamber Orchestra and the Irish World Music Centre are both based in the University of Limerick. The university has a thousand-seat state-of-the-art concert hall that frequently hosts visiting performers. The city has an active music scene, which has produced bands such as The Cranberries and guitarist Noel Hogans MonoBand, The Hitchers and many more. World-renowned electronic musician Richard D. James, more commonly known as Aphex Twin, was born in Limerick in 1971. The Limerick Art Gallery and the Art College cater for painting, sculpture and performance art of all styles. Limerick is also home to comedians The Rubberbandits, DUnbelievables (Pat Shortt and Jon Kenny) and Karl Spain. Dolans Warehouse on the Dock Road has two venues specialising in live music; an upstairs venue which tends to accommodate comedians and folk and jazz acts, and a much larger warehouse venue holding 400, which tends to stage more popular (usually rock) acts, both national and international. Dance music is catered for at Baker Place which holds mainly local underground nights and Trinity Rooms which has regularly hosts big names like Hot Chip, Groove Armada, DJ Yoda and Jazzy Jeff alongside more cutting-edge names like Dan Le Sac, Christian Smith, and Missill. The city is the setting for Frank McCourts memoir Angelas Ashes and the film adaptation. The Frank McCourt Museum situated in Franks former school on Hartsonge Street opened in 2011 and contains many artefacts from the book, it also houses Franks Ashes. It is the setting for the contemporary coming-of-age drama Cowboys & Angels and Robert Cunninghams Somebodys Daughter], which was shot in various locations around the city and had its premiere in King Johns Castle in July 2004. A limerick is a type of humorous verse of five lines with an AABBA rhyme scheme: the poems connection with the city is obscure, but the name is generally taken to be a reference to Limerick city or County Limerick, sometimes particularly to the Maigue Poets, and may derive from an earlier form of nonsense verse parlour game that traditionally included a refrain that included "Will [or wont] you come (up) to Limerick?" The earliest known use of the name "Limerick" for this type poem is an 1880 reference, in a Saint John, New Brunswick newspaper, to an apparently well-known tune. Riverfest is an annual summer festival held in Limerick. The festival was begun in 2004. The 2014 festival was held from 2 to 5 May and had a record 80,000 visitors. Limerick is at the heart of the region dubbed "the Midwest". Also known as the "Shannon Region", this is primarily an economic and social concept. The region encompasses County Limerick, County Clare, North County Tipperary, Northwest County Kerry and south Offaly, with its focal point centered on Limerick and its environs within an 8-kilometre (5 mi) radius.